Given how fundamental the church has been to just about everything the Persuasions have sung in their long career, it’s rather amazing that it took this incomparable a cappella quintet until 1997 to get around to a Christmas album. What’s important, though, is that they did get around to it, because it’s everything you would expect of a Persuasions Christmas album and more, because you never know for certain how the singers are going to find unique ways into their songs. In this case, most of the songs are so familiar as to be daunting, it would seem, to those attempting any variations on the themes. But the Persuasions are just not any group of a cappella practitioners, and so what they do with “Do You Hear What I Hear?” and “Silent Night,” to name a couple of prime examples, is not like anything you’ve heard anyone else do with those songs. Even so, it’s important to remember a fact borne out by the Persuasions’ history: they don’t try to make you forget the original, or most memorable, rendering of the songs they choose to investigate, but rather show you another side of those songs, a different perspective, so that their version enlarges the narrative, adding color, texture and even feelings that may be more subliminal or understated aspects of what you’re used to hearing. Their powerful, soul-drenched version of “All I Have I Have To Do Is Dream,” for instance, doesn’t undercut the beauty of the Everly Brothers’ original hit, but opens it up from a swooning, lovestruck teen paean into a fevered, mature expression of intense physical desire. It’s not like the Easystar All-Stars doing reggae versions of Beatles songs that evoke a strong urge in the listener to hear the Beatles’ great original versions instead. The Everlys and the Persuasions share hallowed ground, each having a parcel to call its own without impinging on the others’ property. Having made entire albums of songs by the Grateful Dead, Frank Zappa, and, yes, the Beatles, the Persuasions are skilled at the art of interpretation, which at its best, as in their hands, is not about rewriting history but rather respecting its deeper undercurrents, finding the hidden nooks and crannies in a song that reveal unmapped emotional terrain within the framework of the definitive text. 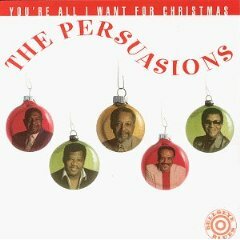 So it is that the Persuasions applied their usual perceptive analysis to the 14 selections on You’re All I Want For Christmas and proceeded, as usual sans any instruments save their own voices, to insist each tune be heard anew. For instance, “Do You Hear What I Hear.” The song belongs to Bing Crosby, period. Done by others, yes; done well by others, unquestionably. But Der Bingle’s original has never been surpassed in the perfection of its arrangement’s evocation of impending wonders and in Crosby’s beautifully modulated vocal so astutely blending both the hope and the exultation of the moment at hand. 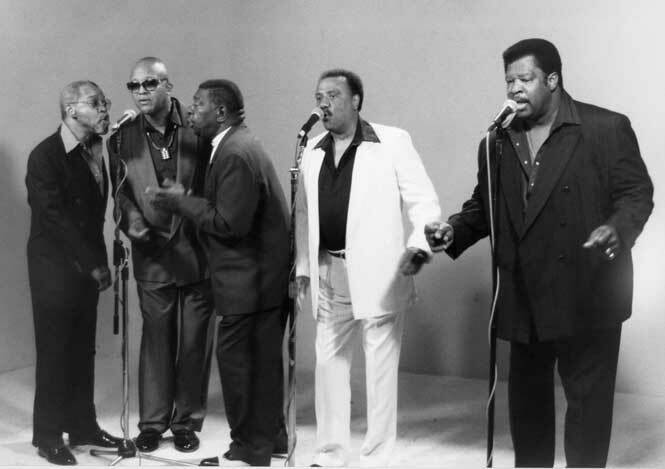 So the Persuasions open their version as they do many of their songs, with the rumbling bass of Jimmy Hayes intoning twice, “Bom-bomp-bom,” ahead of the magnificent Jerry Lawson leading the rest into the song with a high, hopeful, “Do you see what I see?” query. As Lawson deliberately lays out each verse, Hayes keeps the bass steady, with the legendary tenor “Sweet Joe” Russell, along with Jayotis Washington and baritone/bass man B.J. Jones, a new recruit making his impressive debut on this outing, falling in softly behind them; the tension comes from Hayes clearly extending himself to the absolute limit of his lower register as the verse unfolds—his tenuous hold on the lowest note is near palpable in fact. And then one of those miraculous Persuasions moments occurs: with a quick two-note ascent by Hayes, the entire arrangement elevates into the affirmative, harmonized refrain—“A star, a star, shining in the night, with a tail as big as kite/with a tail as big as a kite”—the beauty of which brings them, and us as listeners, into the light. Then, just as quickly, Hayes sounds that rumbling “Bom-bomp-bom” from his depths again, and Lawson starts in on the second verse. The pattern thus established, all that’s left for a listener to do is to appreciate the lyrical tableau as Lawson posits himself as both messenger of and humbled witness to the Holy Birth, adding slightly more urgency to his voice as he relates word of the blessed event passing from the wind to the lamb, from the lamb to the shepherd boy, from the shepherd boy to the mighty king, and from the king to “the people everywhere." It’s nothing short of awesome what the five voices do in reframing this gem while, again, honoring the spirit and the conviction in Crosby’s original. The same magic occurs on “Silent Night.” It breaks from the template in starting with Lawson’s gentle invocation of “Sleep in Heavenly peace” before Hayes gets the bass thumping and his mates’ voices blend in tight, high harmony over it. But ever so subtly—and it is subtle—the group is driving the song a little bit harder every few bars, and Lawson periodically steps outside the melody line to offer a gospel exhortation—“sing it sweet, children,” “oh, Lord!”---and to echo a key phrase along the way. At the 1:09, after the group intones, “Glorious beams from heav’n above,” he lets out a soft chuckle. Sailing along smoothly, Lawson starts dropping hints of the tumult ahead at about the 1:35 mark, when he cuts loose with a gritty, Julius Cheeks-like shout, returns to crooning mode, then goes Cheeks on us again at the 1:40 mark. At two minutes, Lawson gets serious about taking the song back to its church origins—not the church in Austria, where the song was written and first performed (see related stories in this issue), but the black gospel church in his native south—in fact, at the 2:39 mark, he’s so caught up in the looming release that he cries out to the others, “Y’all sound so good, y’all sing it for me, church!” Upon which Lawson ascends to the pulpit, driving the other four forward, letting loose with another chuckle and observing, “Lord, y’all sound so sweet this evenin’…” and taking the lead again to bring it all home. You have to figure Franz Gruber and Fr. Joseph Mohr, who wrote the song in 1818, never figured on it getting such a jubilant yet still profoundly spiritual treatment. But they are sly ones, these Persuasions. They’re not out to make a clean break from history, but to honor it, you see. So the delightful version of Irving Berlin’s “White Christmas” is an out-and-out homage not to Der Bingle—who’s already been given the tip of the hat in the aforementioned “Do You Hear What I Hear,” remember—but to the first great R&B version of the seasonal standard, as recorded in 1954 by Clyde McPhatter’s Drifters. It’s the rare song on which Lawson recedes into the group to give Sweet Joe the deserved keening high tenor lead and of course Hayes, defining the syncopated approach with his warm, Bill Pinckney-style bass lead. Another R&B Christmas classic, “Merry Christmas, Baby,” hews closer to the original, slow grinding treatment of Johnny Moore’s Three Blazers in 1947, with Jayotis Washington taking a mellow, slightly melancholy lead a la Charles Brown, while giving Lawson wide latitude for a mouth guitar version of the Oscar Moore guitar solo (he even gets frisky and adds a little wah-wah scrunch at the end). The wonders never cease here—a beautifully arranged rendition of “The Christmas Song”; a bopping, midtempo take on “Jingle Bell Rock” a few degrees cooler than the usual band versions; a moving, still timely (now, as it was when this album was recorded, as it was when the original was cut) rendition of the Soul Stirrers’ humanitarian Yuletide treatise, “Christmas Means Love” (which is also the title track of Joan Osborne’s 2005 Christmas album), with Lawson’s earnest lead and Hayes’s burbling bass defining a multi-textured soundscape. After this, a triumphant “Joy To The World” simply soars, right up to its gospelized coda, sending the congregation home filled with the spirit of the season in all its glad tidings. The Persuasions have always been about glad tidings, though, in all weathers. Christmas serves merely to emphasize a basic truth about the singers who still ain’t got no band—as Daniel B. Syme observes in his liner notes, “We are part of them and they are part of us.” And may God bless us, every one.